King Janky the Third Release Details by Superplastic! All rise for King Janky the Third! The latest King Janky by Superplastic is almost ready for his coronation into the Designer Toy universe! The third heir to the Janky throne is a royal rebel who only cares about three things: cash, cash, and pool parties. Infamous for getting naked in Atlantic City, NJ and shotgunning a Smirnoff Ice from a prosthetic arm, King Janky The Third is a reminder to all that money can’t buy class! Dropping tomorrow (24th Jan) at 12pm EST (5pm UK). Limited to 1500 but these will likely sell quickly, as the love for Janky & Superplastic is currently very high. Rightly so too. The krew at Superplastic have been doing a great job of releases. Priced at $16 (£12) + shipping. 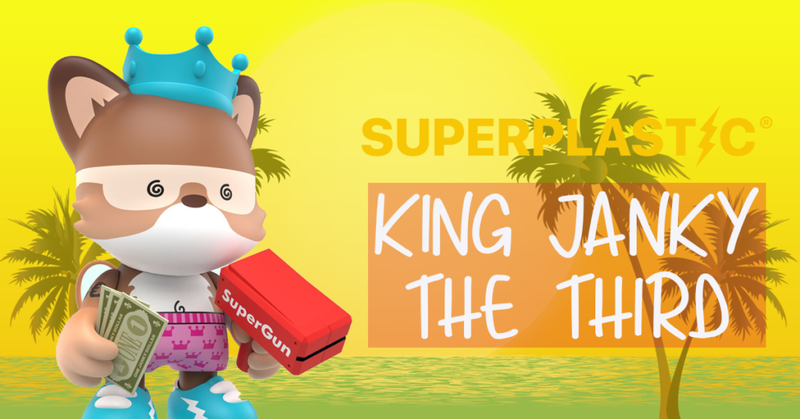 You’ll be able to add King Janky the Third to your Janky collection HERE. The 3-inch vinyl Janky comes with a donut pool float, Super money gun, and a bad habit of blacking out. King Janky the Third sounds like our kinda king! Viva la Third!